In a Hawthorne™ custom spa, a variety of power-packed jets and relaxing seating styles work together to provide effectiveHydrotherapy spa variations. Favorite features, like waterfalls, molded beverage holders, and comfy pillow headrests are standard. And for a custom hot tub experience, the Hawthorne comes standard with Custom Luxury (CL) stainless steel jets and seductive in-spa LED lighting. The waterfall glows with Custom Luxury LED lighting, which includes interior pinpoint lights, plus underwater illumination. 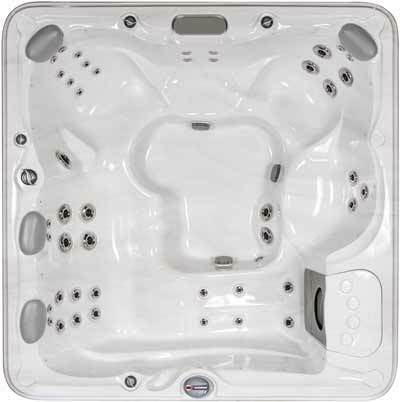 Named for the plant that grows in the English countryside, the spacious Hawthorne hot tub features cozy side-by-side seating as well as a comfortable therapy lounge, both with therapeutic massage jets. Dimensions - 7'8" X 7'8" X 36"